Snowpack in February 2015 was pitifully low in the Cascades and Sierra Nevada mountain ranges. The Cascades and the Sierra Nevada, two major mountain ranges in the American West, experienced record-high temperatures in February 2015. In most areas, even in the middle of winter, it was too warm to snow. Freezing levels were as much as 1,051 meters (3,448 feet) higher than normal, based on the average from 1980 to 2010. This year’s lack of snowpack — which is below 25 percent of normal in both mountain ranges — means less water than usual will be available in the late summer, when snowmelt is important for farm irrigation, fish habitat, and peak demand in cities. The Sierra Nevada is a water tower for more than 25 million Californians and millions of acres of the nation’s most productive farmland. The low snowpack is a main factor in last week’s decision by the Bureau of Reclamation, a federal agency, to deliver no water this summer to Central Valley farmers. In the Cascades snowmelt is an important water source for Seattle, the nation’s fastest growing big city, and for farmers, hydropower dams, and salmon in the Columbia, Klamath, Willamette, Yakima, and other river basins. In both ranges, this winter is a glimpse of the future. Computer models project that the meager snow levels of today will be commonplace within 50 or 60 years if greenhouse gas emissions continue to rise. The maps below estimate the area in which temperatures were below 0 degrees C (32 degrees F) during February 2015, and thus conducive to snow. Data from the North American Freezing Level Tracker was used to compare February 2015 freezing levels (in dark red) with the 1980 to 2010 February mean (in pink). Freezing elevation levels were determined using one central data point each for the Northern, Middle, and Southern Cascades, as well as one point for the Sierra Nevada. Though one data point per mountain range can only give an estimate, the difference is still astounding. 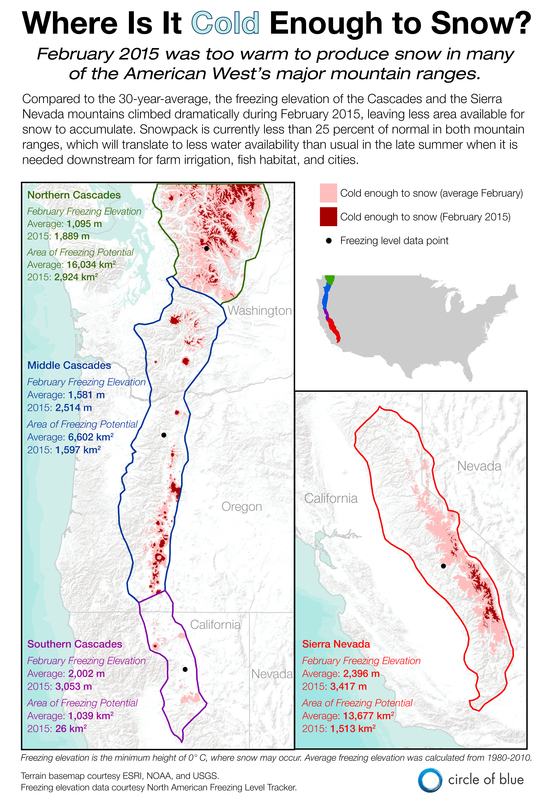 Snow Elevation Maps: It was too warm to snow in much of the Cascades and Sierra Nevada mountain ranges during February 2015. The area in which temperatures were below 0 degrees C (32 degrees F) was much less than normal. Click image to enlarge. Brett Walton contributed to this infographic, which was made to accompany Walton’s article Pacific Northwest’s Winter, Warm and Wet, Is Climate Change Preview. Contact Brett Walton or send a tweet to @WaltonWater. is both a scientist and a journalist, helping to drive Circle of Blue’s reporting with data and research. She holds an MS in Environmental Engineering from Michigan Technological University, and she brings proficiency in ESRI’s ArcGIS mapping software. The Stream, February 11: Water Shortages in Northeast U.S.
Peter Gleick: Why Do You Still Have a Top-loading Washing Machine? It was too warm to snow in much of the Cascades and Sierra Nevada mountain ranges during February 2015. I think global warming is a serious issue, the world is getting warmer because of greenhouse gas emissions. Excellent article and great graphics. Another demonstration that the US, like the rest of the world is overpopulated. Yes, we can divert and dewater more streams and rivers in the US, try to steal some water from Canada, and cause additional environmental damage by building a desalination plant every 50 miles along the West Coast. But if don’t we slow US population growth to zero and then gradually drop to a lower population that will be sustainable environmentally and economically over the long term, things will keep going downhill fast, and not just with respect to water. The political elites and their paymasters want to actually increase the rate of US population growth, which is one reason they favor continuation of high immigration rates. Two conspicuous examples of the moment: 2016 presidential contenders Jeb Bush and Hillary Clinton. Both favor giving permanent resident status to most of the 10-20 million illegal aliens in the US and increasing quotas for legal immigration. Both oppose the elimination of birthright citizenship, one of the biggest incentives to illegal immigration, birth tourism, and chain migration. The scientific and environmental communities have by and large been silent and have been bought off. In exchange for their grants and contracts from government agencies and foundations, they will remain silent about dysfunctional US population and immigration policies. One fairly new exception is Scientists and Environmentalists for Population Stabilization. See our website. It is the only scientist-run population stabilization organization in the US. It is primarily an environmental and educational organization. Its main activity is the operating of exhibitor booths on population at the annual meetings of scientific societies. The “Photos” section of our website shows some of our booths. The website also gives our list of members: we are still small but have many of the country’s top notch environmental scientists, conservations biologists, etc. in our ranks. We are the tip of the spear: the timid and politically correct need not apply!